HELLO PLÁSTICA! » who are we? Hello again students. We started this adventure two courses ago… Do you remember? Welcome all of you. We have plenty of time to learn Arts and Crafts in English. Hello students! You are new in the school and you start with the Bilingual Section. Everything is so new! Soon we will get used to it. We will work hard but we will enjoy it! Hello students of 3rd course . As you already know we start this course with 3º eso. It’s a challenging goal!Los que ahora llegáis a 3º este curso nos conocemos de cuando empezásteis en 1º eso ¿os acordais? Por entonces comenzaba la sección Bilingüe en el Centro y vosotros érais los “conejillos de indias”. 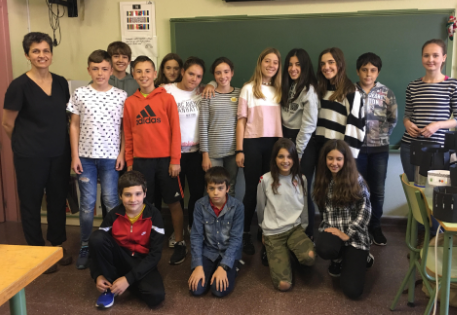 Ya llevamos tres años de programa Bilingüe en el Instituto y viendo el nivel de inglés que hemos conseguido en el aula, yo creo que ha merecido la pena el camino recorrido hasta ahora.And still we have nine months to improve our English level! 1. Trabajo Colectivo, en el aula de plástica, en el que cuento con un ordenador y un proyector fijo. Me sirve para mostrar a los alumnos los contenidos o actividades que quiero que realicen. Normalmente cuento con Laura en el aula (la asistente de lengua inglesa) y entre las dos vamos explicando el material que previamente he colocado en el Blog, como si se tratara de una agenda con la programación de aula. A finales del curso 2006/07 la Consejería de Educación del Principado de Asturias realizó una nueva convocatoria para el establecimiento de otras secciones bilingües en la región (en inglés y en francés). Tras analizar los proyectos presentados y entrevistar a los Profesores interesados en participar en el proyecto, la Consejería seleccionó nuestro Centro como uno de los que impartirían la enseñanza bilingüe en inglés, a partir del curso 2007/08. Una vez realizada la matrícula y ante la gran demanda de alumnos que solicitaban participar, se concedió la ampliación de la sección bilingüe a dos grupos en 1º ESO. En el presente curso 2008/09, se están impartiendo dos materias no lingüísticas: Educación física y Educación Plástica y visual, en dos cursos: 1º y 2º ESO. Tenemos un total de 65 alumnos bilingües y tres profesores de materias no lingüísticas implicados. I’m Elba and I am twelve years old. I’m tall. I have light brunette hair. My eyes are dark brown. I have one brother. He is 18 years old. My course is 1ºa E.S.O. My teachers are very funny. My favorite subjets are Music, Art and P.E. but I like other subjets too. I love music, my favorite groups are: Linkin park, Blink 182 and Jonas Brothers. I love playing the piano. I love paint Manga( it’s a japanese art) and I like comics Manga: My favorite comic serie is Naruto. I am tall. My eyes are green and my hair is long, and dark blond. I have got one brother. His name is Miguel, and he is ten. I love reading. My favorite books are: Harry Potter and the Globet fire, and two trilogis: La maldicion del Espectro and Crepúsculo. I like rock music. My favorite songs are Eternal flame (The Bangles), and Yersteday (The Beatles). I like the music of Queen too. I play the traverse flute and piano. My name is Sara and I’m 12 years old.My course is1 ESO. I’m tall. My hair is brown and long and my eyes are brown too. I have got one sister. Her name is Adriana and she’s 13 years old. Her course is 2 ESO. I live in Posada De Llanera.It’s a small city but is very funny. I like pop music. My favourites groups of music are Pignoise and el Canto Del Loco. My other interests are playing tennis and playing the clarinet. My name’s Nerea,and I’m twelve years old. I live in Soto de Llanera (Asturias,Spain). I have light brunette and long hair. I have got brown eyes. I have a normal height. I haven’t got a brother. MY name is Pablo.I´m twelve years old . I´m tall . My hair is brown and my eyes are blue. My name is Gissella and I’m 12 years old. I live in Posada de Llanera. It is a small city. My course is 1º Eso, and I like music ( my favourite groups music is La Oreja de Van Goch) and my favourite sport is swimming (its very funy). I´m small.My hear is browm and my eyes are green. I like playing football.My favorite hobby is playing the playstation. Hi my name is Saúl . i`m twelve years old . I´m tall . My hair is blak. My name is Sergio. I´m 12 years old. I live in lugo de llanera. I one sister. Her name is Laura she is 5 years old. My I.E.S IS IN Lugo de Llanera. hi I´m Dani I´m 12 years I like basketball. the blog is good but I don´t like photos. The new photo is more beautiful than the old photography. I like this photo group. I´m Claudia. I´m in 3ºC in the I.E.S Llanera. I like this subject (arts) and the blog is very interesting and funny . Hi! 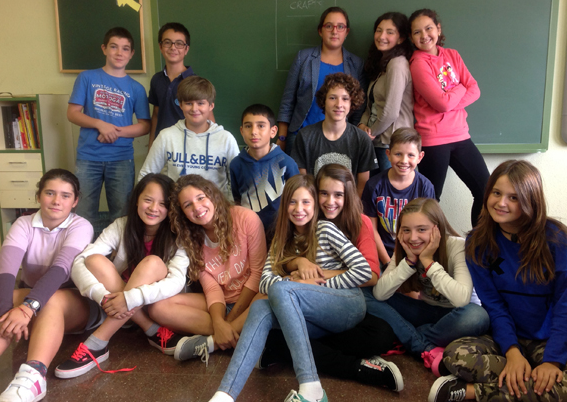 We’re from 3º C and 3ºB. We are in art class. The photos are fantastic but our faces are horrible jajajaja. We like art so much, and we like halloween’s activities. I hope that this year is going to be so interesting and nice. Hi, I’m Carlos and I’m 14. I’m in 3rd ESO B. I like cycling and playing computer games. I don’t like doing my homework and studying, because it’s boring. I´m Maria. 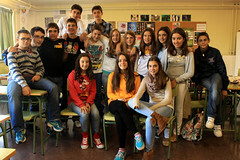 I´m in 3ºB. this year, I like so much art in english because it is very interesting. I think that this blog is very funny. 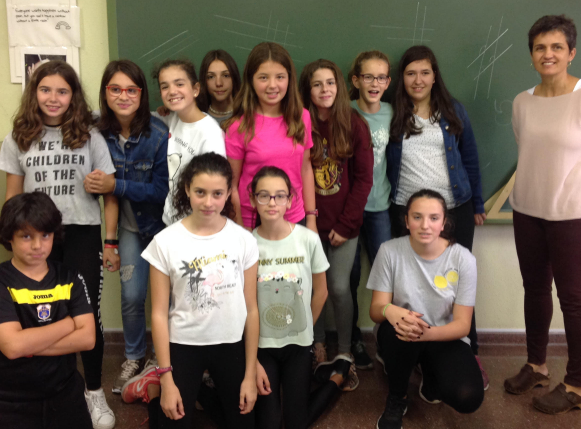 We are Cova and maria from 3ºESO. Cova lives in Ferroñes and I live in Lugo. Now we are in class and we are visiting the blog. It is very interesting and happy. we are very happy with our language assistant. she is very nice. Cova & Maria :):) Bye! H! I am Pelayo. I´m fourteen years old. I live in Lugo de Llanera. I have one brother. This year, I like more the Bilingüe Section because we go with 3ºC and it is very nice. Amy is very nice and I think we could learn a lot of with her. We are Salinas and Alvaro and we´re 14 years old. We are in the third grade. 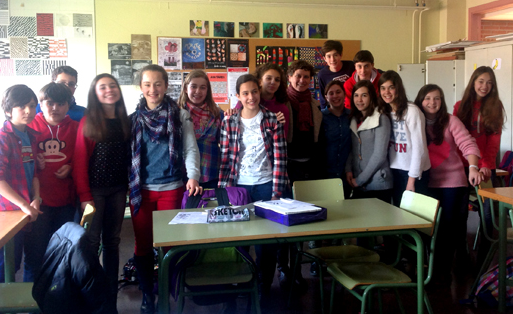 Our teacher is Isabel and we´re in the Bilingual Section. This year we´ve got a new American reader called Amy and she´s nice. The blog it´s so cute and the photos are nice. Hi, we are on bilingual group, we study english. i’m iñigo and i’m 14.
i live in soto de llanera. I live i na la Fresneda..
hiiiiiiiiiiii¡¡¡ im german and im 12 years old i live in la fresneda i love plastica bilingue , and the teacher is veri funy. HI I’M AZUREL I’M FOURTEEN YEARS OLD I LIVE IN LUGO DE LLANERA BUT I’M FROM CANARY ISLAND. 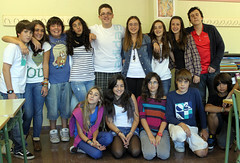 THE VIDEOS AND THE PHOTOS ARE COOL I LIKE THE PHOTO OF OUR GROUP(3ºA).